Short and fairly straightforward ride up the Loire today to Sully-sur-Loire. Enroute we had a quick look at another chateau at Saint Brisson sur Loire, this one with a collection of replica medieval trebuchets on the grounds that they apparently fire into a nearby lake on special occasions! 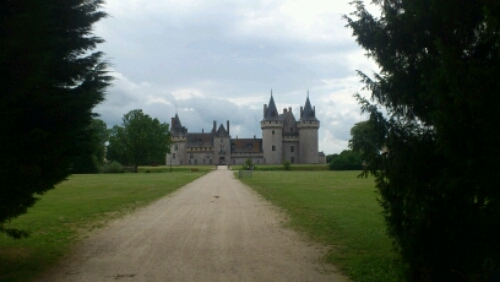 Sully is home to one of the really famous chateaux on the Loire, entirely surrounded by a moat and with classic pointy tower tops. Lodging for the night was another gym floor, but this was improved by the fact that the property backed right onto the back end of the moat around Sully chateau, so we had a good spot for picnic dinner.